Rob Edwards cautions that charities ignore the growth in negative media attention at their peril, and outlines Fundraising Institute Australia’s initiatives to give fundraising back the good name it deserves. A persistent issue for charities is negative attention from the mainstream media. 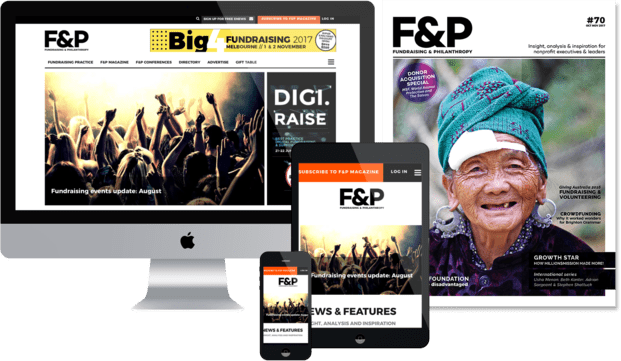 Since trust and reputation are critical in fundraising, the risk of harmful messages being spread about the profession and organisations is a problem the sector can’t afford to ignore. As the sector’s peak body, Fundraising Institute Australia (FIA) is ‘at the coal face’ of many media requests about fundraising topics. Negative news stories and enquiries have been increasing of late with the 24/7 news cycle and a heightened focus on sector accountability and transparency following the establishment of the Australian Charities and Not-for-profits Commission. FIA regularly receives calls from journalists wanting to take yet another pessimistic look at topics such as the cost of fundraising and face-to-face – all in the name of so-called public interest. One recently suggested that a better idea for street collectors would be to simply stand there and wait for pedestrians to come up to them! These sorts of attitudes and misconceptions are worth noting because they are products of the Australian mindset and they also help to produce it. Finding fault with charity approaches is a recurrent theme, which indicates a need for building public awareness about the role of fundraising and its importance. Of course, charities should operate with the highest ethics and principles, and be accountable to donors and other stakeholders for their operations. Along with the FIA’s code for professional conduct, journalist questioning plays a part in helping ensure this happens. However, any reporting has to be balanced or there is a real danger of ill-informed media stories damaging charities’ hard-earned reputations, eroding the trust of their supporters, and hindering their fundraising effectiveness. In greatest jeopardy is face-to-face – the channel that brings in most new regular givers. This is because bad press can stoke the kind of community backlash that leads councils to impose permit restrictions like those proposed in Brisbane in February. Part of FIA’s role is representing the sector and upholding its reputation. In mid-2012 FIA introduced new media protocols, created in consultation with charities and face-to-face suppliers. These now guide a more rigorous and systematic response to negative media inquiries. An existing sector email notification system was leveraged and expanded to quickly and easily communicate with charity fundraising and media staff about these enquiries. The protocol is structured so that charities deal with requests relating to them, but when enquiries branch into broader issues or concern a number of charities, they are referred to FIA. The new system has enabled FIA to be a lightning rod for mainstream media commentary, giving the sector one voice, and it is mitigating the scale and tone of negative coverage. In fact, one Daily Telegraph article which started as a ‘name and shame’ cost-of-fundraising league table ended up being a positive look at the importance of fundraising, featuring a large photo of fluffy puppies. The next step to show fundraising in the light it deserves was to design a proactive campaign to push positive stories into the community. So FIA has created an exciting new three-year digital initiative called the ‘Doing Good’ campaign. This national drive aims to raise Australia’s overall level of philanthropy by encouraging a more engaged and giving society. FIA is enlisting celebrities, philanthropists, civic and business leaders from around Australia to inspire others to get behind charities by sharing stories about causes close to their heart and the reasons they give. To tap into peer influence, primary campaign activity will take place on social media sites such as Facebook, Twitter, LinkedIn, Pinterest and Instagram. This will enable an organic, wide-reaching impact and authenticity via the sharing of personal stories by people within their own networks, their local community and beyond. There will also be a dedicated website and YouTube channel, PR activity and above and below-the-line advertising to punctuate key campaign milestones. An important stage in the campaign’s first year will be the ‘Doing Good’ challenge, calling on Australians to do a good deed and donate to one or more charities, then tell their friends about it and encourage them to do the same. While the dialogue is open to everyone, only FIA organisational members will be able to display a ‘Doing Good’ thumbs-up logo on their website as a campaign participant. This will provide a platform to promote their cause with existing and new donors and motivate larger or more frequent gifts. Participating organisations will also receive a campaign kit, with written materials to guide activities, ideas to support the campaign and a media pack to help promote ‘Doing Good’ to existing media contacts. FIA is currently in discussions with a major campaign sponsor and is talking to other partners. The campaign will launch mid-year and any charities wishing to express their interest in participating should email [email protected]. If your organisation is not already an FIA member, I encourage you to join your peak body and partner with us to promote this valuable initiative. With today’s often negative public attention, it is vital the sector unites to strengthen the image and culture of giving in Australia and to spread the word about the value that generosity brings to the broader community. Let’s switch the focus from criticism to celebration. Rob Edwards is the chief executive officer of Fundraising Institute Australia.